You don't need to live on a farm to raise happy, healthy honeybees. 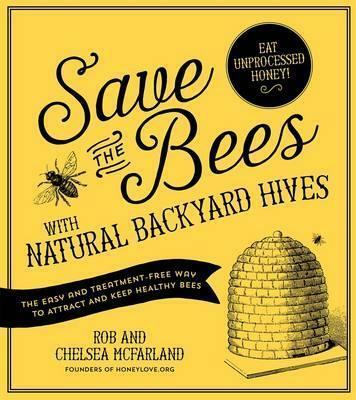 All it takes is a small backyard and the guidance of Rob and Chelsea McFarland, founders of Honey Love, a Los Angeles-based nonprofit dedicated to protecting honeybees and educating a new generation of urban, suburban and rural beekeepers. Beekeeping is a relaxing and intriguing hobby that requires little time. It yields fresh, local honey beekeepers can keep or share, and bees help pollinate nearby gardens, trees and crops, which need help. Around the country, bee populations are declining in part because bees raised to pollinate crops are not as durable as wild bees. Better Beekeeping has the solution. Better Beekeeping will walk readers through the inexpensive and easy to use equipment, their method for acquiring a hive for free, caring for the bees as they grow their colony, harvesting honey and prepping their bees for the cooler months. With the Better Beekeeping approach, readers will learn to attract wild bees. Factory-farmed bees are often advertised as "natural" but require farmers to use chemicals and pesticides to keep them alive. The Better Beekeeping approach does not use chemicals or pesticides and, instead, opts for natural care and management. With minimal upkeep, the hives will pollinate local crops and flowers and provide a bounty of delicious, all-natural, backyard honey. Publisher Page Street Publishing Co. Rob and Chelsea McFarland are the husband and wife team behind HoneyLove (honeylove.org). HoneyLove has more than 30,000 Facebook followers and a full calendar of educational and community-based events. HoneyLove has been profiled by the Associated Press, LA Times, ABC News, Time, Politico, LA Weekly, Sunset, Edible Westside and Curbed LA. Both SoulPancake and the Disney Channel have featured HoneyLove in video segments. Rob and Chelsea live in Los Angeles, California, where HoneyLove is based.